“Don’t Hold Your Breath,” an EPIK Dance Company presentation, follows Kat, a woman tiptoeing the line between her party girl past and the thought of finally growing up and settling down. Typically confident and self-assured, she’s now grappling with the idea of life and death. Kat finds herself in an MRI machine that could ultimately determine her fate. As the machine examines her body, she begins to examine her life, causing her to confront some of life’s most existential questions. Has she spent her time wisely? Would she do anything differently if given a second chance? When it comes down to it, and all distractions are stripped away, what is truly important? Her thoughts take her to memories of her past and visions for her future as she faces the reality that life is finite and tomorrow is not promised. 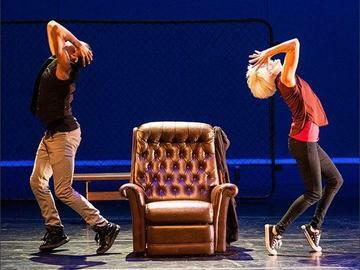 EPIK is known for fusing street and classical dance forms with performance art to tell stories. A Mayor’s Arts Award winner and three-time Governor’s Arts Award nominee, EPIK continues to make bold statements with their performances and work in education and art for social change. EPIK has sold out theaters with their critically acclaimed shows, “Common Ground,” “EPIK Effect,” and “Simply EPIK.” In “Don’t Hold Your Breath,” audiences will be entertained with a fusion of original choreography and music, live vocals and instrumentation, spoken word, video, and more. BY ENTERING AND BY YOUR PRESENCE AT DON'T HOLD YOUR BREATH, YOU CONSENT TO BE PHOTOGRAPHED, FILMED AND/OR OTHERWISE RECORDED. YOUR ENTRY CONSTITUTES YOU CONSENT TO SUCH PHOTOGRAPHY, FILMING AND/OR RECORDING AND TO ANY USE, IN ANY AND ALL MEDIA THROUGHOUT THE UNIVERSE IN PERPETUITY, OF YOUR APPEARANCE, VOICE, AND NAME FOR ANY PURPOSE WHATSOEVER IN CONNECTION WITH DON'T HOLD YOUR BREATH. YOU UNDERSTAND THAT ALL PHOTOGRAPHY, FILMING AND/OR RECORDING WILL BE DONE IN RELIANCE ON THIS CONSENT GIVEN BY YOU BY ENTERING THE EVENT. IF YOU DO NOT AGREE TO THE FOREGOING, PLEASE DO NOT ATTEND DON'T HOLD YOUR BREATH.